Spacious apartment with stunning views overlooking the sea and the picturesque harbour town of Kas. Seaview apartments “Kas Residence” sit above Kas town. 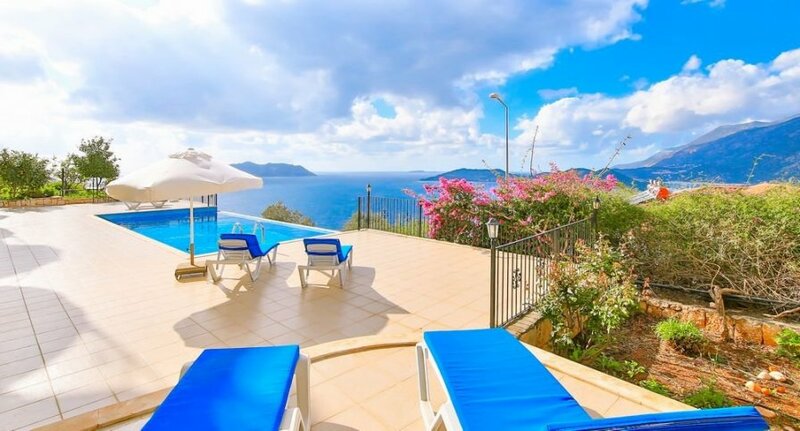 The position ensures stunning views overlooking the town and the sea. Imagine watching the sun go down while sipping on a glass of wine on your balcony. Far enough from the bars in Kas centre to secure a good night sleep, close enough to be in the middle of it when you want to. Bars, shops and restaurants are plentiful in the town centre only a 10-minute stroll down the steep mountain road. The beach can also be reached easily this way. Back up there is the regular Dolmus (minibus) stopping only a 5 minutes’ walk from the apartment or a taxi ride is about £3. Seaview Apartment Manzara sleeps 4 persons in one double and one twin bedroom, each with ensuite bathrooms. The apartment is air-conditioned throughout, has a spacious living and a fully equipped open plan kitchen for self-catering with a washing machine, dishwasher and a microwave/oven. There is satellite TV, DVD player and internet for entertaining yourselves. The infinity pool is 10m by 4,5m and is shared with the other apartments in the residence. Each apartment has it's own sunbeds and the sun terrace is spacious. The picturesque harbour town Kas (Antiphellos in the Greek era) is renowned for its natural charm at the Turkey Rivera. It has an attractive harbour front along which there are several tea gardens, cafes and restaurants. Leading away from the harbour is a warren of winding cobbled streets with colourful shops filled with carpets, ceramics, arts and crafts. Kas has a true cosmopolitan feel as there is a wide variety of nationality of tourist with Turkish making up approximately 60%. This ensures that Kas retains the essence of a traditional small Turkish town. There is no mass market tourism so most visitors are independent travellers. There are several supermarkets in Kas for grocery supplies, a good fruit & veg shop stocked with local seasonal produce, several bakeries and fishmongers. There is a vibrant and busy market every Friday. There are several historical areas in Kas with Lycian tombs scattered throughout town and the ancient amphitheatre. Kas does not have a sandy beach, but it does have a few pebble beaches and several sun terraces right on the waterfront with sun loungers, bars and other facilities. The fabulous sandy beaches of Kaputas (15 km) and Patara (35 km) are easy to get to by minibus and/or boat. Similarly, a fifteen-minute boat trip will take you to Limanagzi - a beautiful beach with a very relaxed atmosphere on the opposite side of the bay. On the peninsula, there are also a couple of beaches with full facilities. Kas is centrally located in relation to many interesting antiquities and areas of natural beauty making it an ideal base for day trips and excursions. The most popular day trips and excursions are; a boat trip to the ancient Lycian city of Kekova, the remains of which are mostly submerged. You can go swimming and snorkelling during the trip. Lunch is usually included and is consumed in one of the little restaurants on the waterfront in Kekova. After lunch you have time to go and see the castle of Kekova and the Lycian graves. You can also go on a boat trip to one of the many little islands just off the coast. If you hire a car, you can visit the ruins of the ancient city of Myra, the St Nicholas basilica at Demre, the waterfall between Kas and Kalkan and the stunning Saklikent Gorge all on the same day. Try to be at the gorge around lunch time if you can, so you can lunch on the floating platforms on the river. Lovers of antiquity should also make a point of visiting the highly recommended ruins of Tlos along the way. A trip to Xanthos, which is inland from Kalkan, is also definitely worth doing. Stunning views overlooking the sea, harbour and village.